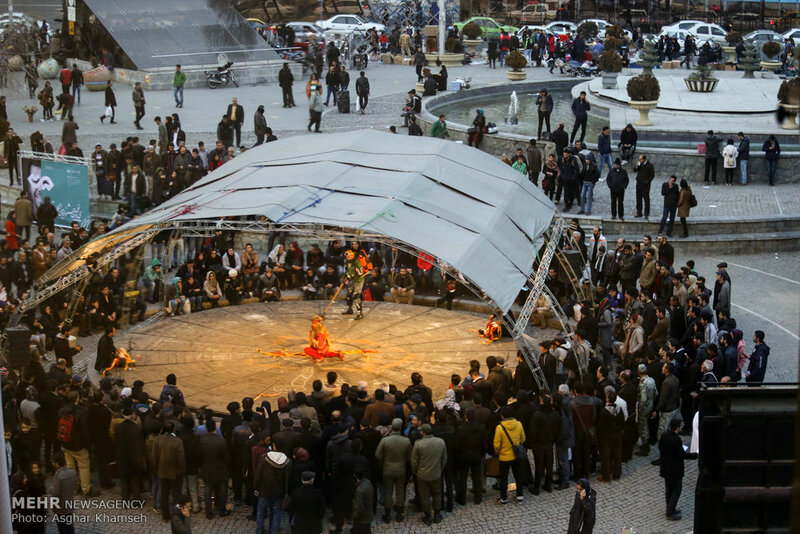 The number of theater-goers in Iran has steadily risen throughout the years, even as ticket prices skyrocketed in the past few months from a reasonable 20,000 tomans to as high as 100,000 tomans for fancier performances at major venues. This is why the Fajr Theater Festival has always been a darling with the country’s art-loving community. The festival promises a plethora of high-quality plays from across the country and abroad, with reasonable prices for tickets that could be affordable by those on a rather tight budget. Looking at the program for this year’s festival, there is a noticeable lack of familiar names jumping at you, piquing your interest. This could have a positive connotation of course, in the sense that younger artists have been given more room to artistically express themselves. On the other hand, a lack of strong presence by household names in theater community may come across as disappointing to serious playgoers. which were beautifully performed and left a lasting impression on the audience. This year, another Różewicz's plays – ‘The Trap’ – was staged by Esmaeil Movahedi at the festival’s opening night, but the performance was not up to par. li Rafiei’s huge and costly production ‘The House of Bernarda Alba’, written by Spanish dramatist Federico García Lorca, which had a number of successful runs prior to the festival, did not manage to awe the audience the same way Delkhah’s ‘Mephisto’ had done. in this year’s program. from Germany staged an invigorating interpretation of Shakespeare’s most performed play to a full house. The performance brought the young director a nomination and its outstanding actress Katja Bürkle the Best Acting award. Fajr 35th in 2017 also had a brilliant staging of Hamlet; once again from Germany, and this time by renowned director Thomas Ostermeier. The performance won the festival’s grand prix that year. Still, the lineup this year does include a Shakespearean tragedy. than Shakespeare's. And the play is not even participating at the competition section. 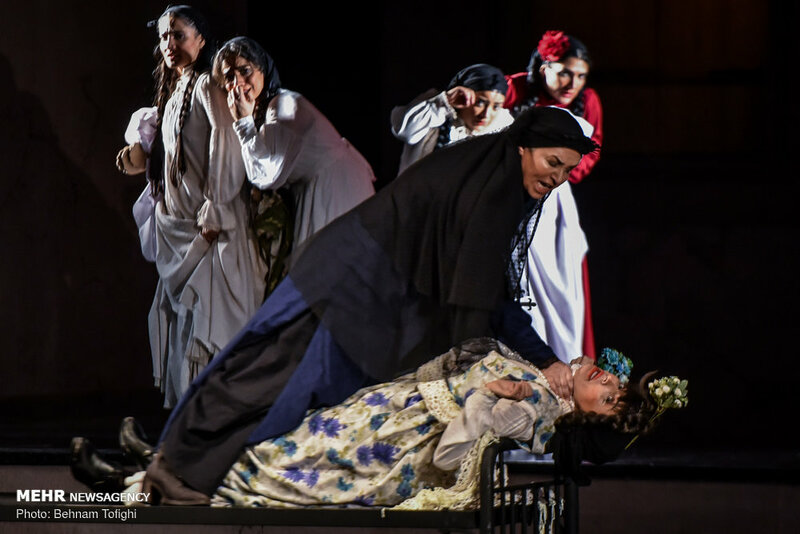 Nevertheless, ‘The House of Bernarda Alba’ opened to a full house at Vahdat Hall – Iran’s only opera hall – and the performances by the all-female troupe were magnificent, especially Roya Taymourian in her convincingly dark and menacing role as the domineering matriarch Bernarda Alba, and Maryam Sa’adat in her role as Bernarda's conniving, yet sympathetic, maid Poncia. y had the ill fortune of being too long, with the passage of time pressing heavily upon the drooping eyes of the spectators as lengthy dialogues dragged on. Furthermore, the play is in the non-competition section, which means more opportunity for younger artists to win a much-needed cash prize to fund their next project. In terms of figures, the 37th FITF has an insanely packed program, like its previous editions: 155 plays in total, with 142 of them by Iranian directors (54% from capital Tehran and 46% from other provinces), and 13 by foreign directors. The number of foreign plays has dropped considerably compared to previous years, pointing to a serious challenge for the international section of the festival. Another important factor to take into consideration is the low number of selected plays by female directors: 26 plays by female directors vs. 129 plays by male directors. It is indeed a dauntingly disappointing figure, which needs better decision-making on part of the festival’s committee in charge of drawing up the lineup. The 37th Fajr International Theater Festival, directed by Nader Borhani Marand, is underway in Tehran from 11 to 22 February 2019.